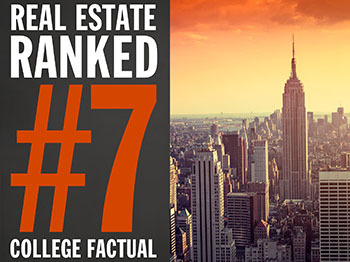 The Martin J. Whitman School of Management’s real estate program was ranked #7 in the country by College Factual, a website that helps students find the best colleges and universities for their unique needs. As part of the Finance Department, Whitman’s real estate program offers comprehensive and timely coursework, combined with practical experience through industry speakers, Argus training and case and project work, based on real-world real estate projects. The skills and insight gained during hands-on learning and interaction with successful executives gives students a decided edge over their peers in the marketplace. The James D. Kuhn Real Estate Center is committed to enhancing the quality of the curriculum and the experience in the real estate program. The center sponsors lectures by expert speakers, a one-week real estate course taught in New York City every year, Argus and Excel Modeling workshops and a real estate symposium to explore the latest trends. Additionally, the center offers mentoring and networking opportunities with accomplished alumni, including many who serve on the Whitman Real Estate Advisory Board. College Factual’s ranking methodology examined components including graduate earnings, resources allocated to the program and whether the school/program is accredited.